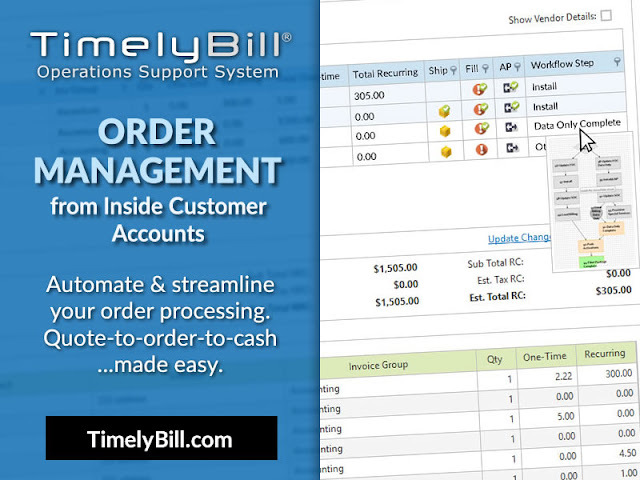 Company blog for TimelyBill, our cloud-based SaaS telecom billing system. Find application news, tips, company announcements and more. TimelyBill will be at The INCOMPAS Show – the most beneficial event for making deals and new business connections. The INCOMPAS Show has been designed with your experience in mind. Make important business connections, close deals and learn about the latest technology trends, all in just three days. While you explore the Expo Hall, be sure to stop by our booth. WHEN: October 23-25 at the Gaylord Texan Resort & Convention Center in Dallas, Texas. WHAT: Stop by our booth to meet with our experts and learn about TimelyBill's latest features. TimelyBill will be at The Channel Partners Conference & Expo – The Gathering Place for the Technology Services Community. While you’re at the show, be sure to visit with us. WHAT: Stop by booth #401 to meet with our experts and learn about our latest products and services. Statement on Standards for Attestation Engagements No. 18 Bill Perfect, a developer of customer life cycle management solution for most service providers, including Local Exchange Carriers, Cable and Satellite Providers, Voice Over IP Providers, and Enhanced Communication Providers; today announced that it has successfully completed a System and Organization Controls (SOC) 1 Type II Report for their TimelyBill® Operations Support System. A SOC 1 audit is performed by independent auditing firm and examines the controls and processes involved in storing, handling, and transmitting data securely. The successful completion of the voluntary audit illustrates Bill Perfect's ongoing commitment to create and maintain the most stringent controls for the protection and security of its customers' confidential information. More information about Bill Perfect and their services can be found at TimelyBill.com. TimelyBill helps telecom companies deliver consistent customer experiences across departments and channels. Learn more about our core customer relations management component and "self-care" customer portal. TimelyBill is a convergent charging and billing solution for the telecommunications industry. Our software enables the common management of all users and services for operators. Related article: "Things to Look for When Selecting a Telecom Billing Software Vendor"
TimelyBill is a subscription billing and revenue management software. We enable telecom service providers to introduce products, rate cdrs, generate invoices, collect payments, offer bundles, share profit with partners, detect fraud and many other revenue related functions. cloud-based subscription billing and OSS for telecom, VoIP and wireless communications service providers.